There has been a lot of energy surrounding Microsoft’s Power Platform lately. A couple of weeks ago during a presentation he gave on campus, Satya Nadella talked about the importance of the Power Platform and how it serves as a core offering for our customers. Microsoft 365, Dynamics 365, and the Power Platform on top of what we’re doing with Azure is the core of what we are doing as a company vis-à-vis I would say our commercial customers – businesses of all sizes, whether it’s small business, large business, whether it’s in an emerging market or in a developed market. The Power Platform is today comprised of three services – Power BI, PowerApps and Flow. While each of these services is best-of-breed individually, their combination as the Power Platform is a game-changer without equal for our customers. I wanted to spend some time today introducing you to our vision for this platform and, more importantly, to highlight some of the people and organizations leveraging it to bring that vision to life. Now more than ever, organizations have embraced the value of using data to drive business outcomes. They’ve adopted the cloud to store mass quantities of data and have become more efficient at harnessing data and signals coming from a multitude of sources such as web traffic, social media and business systems such as CRM/ ERP applications. But once they’ve implemented the infrastructure for harnessing data, how can they make that data work for them most efficiently? They need a layer atop that data that lets all workers, regardless of technical ability, leverage it in a straightforward way to drive business impact. That’s what the Power Platform does. It is a system that enables users to do three key actions on data that help them drive business: Analyze, Act, and Automate. We do this with Power BI, PowerApps, and Flow, all working together atop your data to help EVERYONE, from the CEO to the front-line workers, drive the business with data. While we believed what we were doing would make a positive business impact for our customers, none of us fully anticipated the impact it would have on the lives of those it touched. Last year Satya said something about those who come to Microsoft that really resonated with me. More than anything else, this is power of the Power Platform. For several years now our teams have been quietly developing and working with a community that has swelled to millions of monthly active users globally. We’ve been guided by a belief that magical things are possible when technology is made approachable and accessible to those in the best position to identify transformative applications – those who work on the front lines of a business. There is a growing community of people who have discovered the Power Platform, leveraged it to drive transformational change for their organizations and in the process completely changed the trajectory of their careers and lives. 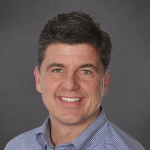 Nick Gill, a training specialist at the American Red Cross, who with no formal IT background taught himself how to use Power BI, PowerApps and Microsoft Flow then used them to transform a process that over 650 First Aid and CPR instructors use to order training class supplies. Nick has since been promoted to Manager of Logistics for the Preparedness, Safety, and Services department for the entire country. You can learn more about Nick and his work on the PowerApps Blog. Ashley Culmsee, a psychology student with no IT experience learned to use PowerApps and Flow. With her father she built “the universal audit app” – allowing people across many industries to perform inspections and audits. Ashley’s story about how she got into building these apps is pretty amazing and inspiring. Growing up she suffered from anxiety and social phobia and in the Power Platform found an outlet and built a passion for technology. Today she works with her dad Paul Culmsee running hackathons and building Power Platform-based solutions for mining and engineering companies worldwide. Here is a blog from her dad that speaks to the impact the Power Platform has had on his daughter. Martin Lee, was a dispatcher at AutoGlass, and built his first app to automate the process field technicians use to update their job status while out repairing chipped and broken glass on autos. As a dispatcher, Martin saw firsthand the inefficiency of their old process. In the summer of 2017, he taught himself PowerApps, built and deployed his first app into production within one month. By October 2017 he had singlehandedly deployed eight apps used by more than 1,500 technicians. Martin has since moved from his role as dispatcher to a dedicated technology role. He has since built 50 more apps and deployed them across the business to more than 3,000 employees. You can learn more on Martin by watching this video. Brian Dang, was a third-grade teacher in Southern California who discovered PowerApps and used it to build some pretty stunning applications for his students, other teachers and for the school district. When I first met Brian we were preparing for an upcoming PowerApps technical review with Bill Gates. Knowing Bill’s passion for technology and education I invited Brian to join us in the meeting to show off his great work. My colleague Sameer Bhangar interviewed Brian when he came up for that meeting. A couple weeks after this video was produced Brian moved to Redmond and joined the team at Microsoft! Over the last year he’s helped thousands of others across the globe discover and master the Power Platform. Each of these individuals is deeply engaged in the Power Platform community, helping others succeed as they have. 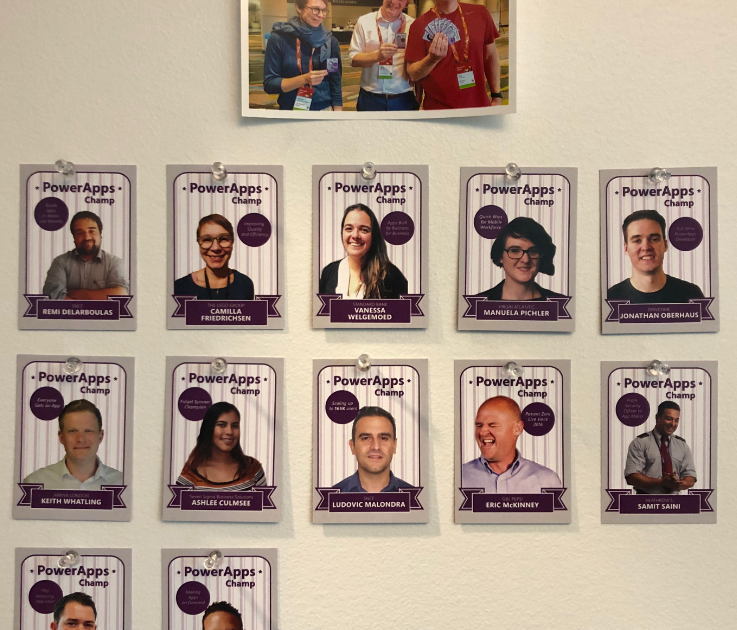 To celebrate and recognize these champs, our Power Platform “Customer Success Team” created a set of trading cards. My growing collection hangs just inside my office door and helps me start each day focused on what really matters – the people we’re empowering to achieve more. My growing collection of Power Platform champs trading cards as of January 2019. 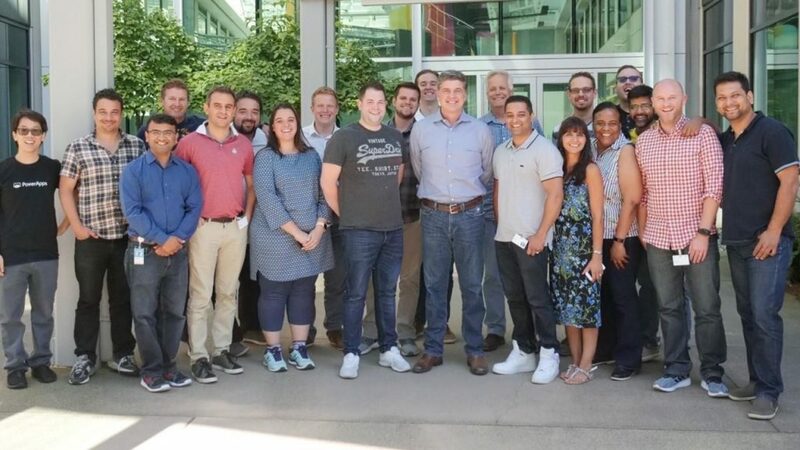 Meeting up with some of our Power Platform champs in July 2018. Our vision for the Power Platform started from the recognition that data is increasingly flowing from everything, and a belief that organizations that harness their data – to gain insights then used to drive intelligent business processes – will outperform those that don’t. We also recognize there aren’t enough programmers, data scientists and tech professionals to go around. So our goal was to build a platform not targeting these technology experts but for people like Nick, Ashlee, Martin and Brian – and the millions of other frontline workers who see opportunities every day to create something better than the status quo, but who’ve never been empowered to do anything about it. Our guiding vision was a framework we called the “Triple-A Loop” – a closed-loop system allowing users to gain insights from data (Analyze) used to drive intelligent business processes via apps they build (Act) and processes they automate (Automate). The Microsoft Power Platform implements this vision via three cloud-based services: Power BI, PowerApps and Flow. Power BI is a self-service business intelligence solution that makes it easy to connect, analyze and gain insight from the data that runs your business – wherever that data may be: in the cloud, or in your own data center; in an Excel spreadsheet or SharePoint list, an Oracle database or in an SAP or Salesforce application; or in any of the hundreds of other systems with built-in support by the Power Platform. Power BI was the first Power Platform service delivered, entering preview in January 2015. In just four short years, Power BI has been adopted by tens of thousands of companies and millions of users. Every single month the service has been updated and improved. Some of the service metrics today are just stunning: Power BI is available in 43 languages and used across 18,000 cities spanning the globe. Nearly 10 petabytes of data are uploaded to the service each month with more than 10 million report and dashboard queries executed against that data every hour (!) on behalf of users. But insights without action are little more than idle chatter, so, while we were busy pushing toward general availability with Power BI we were simultaneously creating the services that would make Power BI’s insights actionable: PowerApps and Flow. PowerApps is a “citizen application development platform” – allowing anyone to build web and mobile applications without writing code. 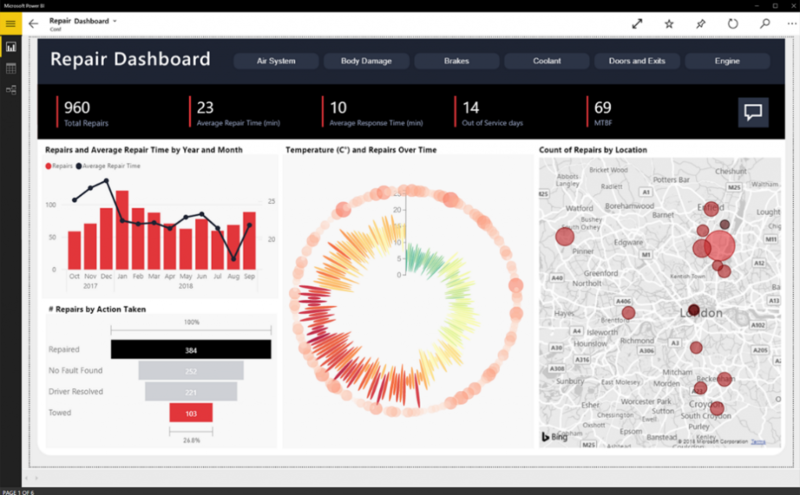 The natural connection between Power BI and PowerApps makes it effortless to put insights in the hands of maintenance workers, teachers, miners and others on the frontline, in tailored and often task-specific applications that supercharge their productivity and make their work perhaps a little less tedious. Like Power BI, PowerApps connects to hundreds of business systems and databases, making it easy to connect workers with the existing processes and data that makes the business tick. And all the data captured in PowerApps can make its way right back to those very systems for further analysis in Power BI creating a closed-loop process for continuous improvement. Additionally, PowerApps comes with a built-in, fully-managed, enterprise-grade datastore called the Common Data Service (CDS) for those applications that generate data not destined for a legacy system – and Power BI and Flow have deep connections to CDS making it that much easier to get even more value from data stored there. 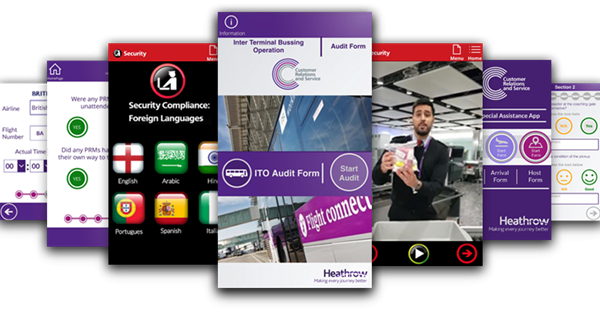 I can remember like it was yesterday a meeting that really cemented for me that PowerApps was going to be a game-changer for our customers. In the Spring of 2016 I met with Integrated Power Services – a company that traces its roots to 1904. Sitting in a conference room in building 44 on our main campus IPS told me how they’d built a PowerApp that transformed their core business process – inspecting and repairing large electric motors and generators from a variety of manufacturers. Turns out there’s not “an app for that” and before PowerApps the technical hurdles to build such a solution put it far beyond their reach. I’ve never had a customer so completely energized and excited by one of my products. For them PowerApps was like magic – they’d transformed an error-prone collection of manual processes into a tablet-based app their repair professionals could use to fix motors faster, with fewer errors and while keeping their customers informed of the process in a way never before possible. And they built the app right on the shop floor at one of their depots, with the repair personnel who now use the app. Robotic Process Automation (RPA) is garnering a lot of interest and attention in the market – with pure-play vendors raising enormous sums of money at astronomical valuations. By automating simple tasks, RPA solutions promise to lower costs while reducing errors. 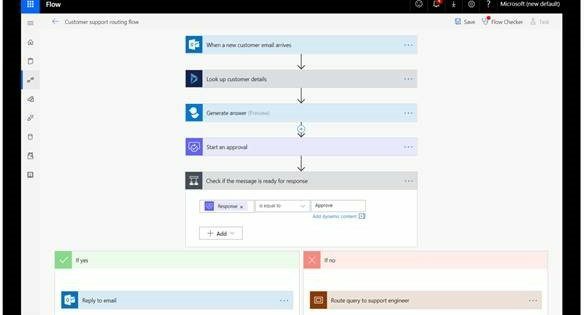 Microsoft Flow is an intelligent process automation service that goes beyond simple task automation, allowing non-technical users to automate complex business processes and workflows without a complex IT deployment. Through a simple and intuitive interface, users can create automated workflows that can be triggered by insights from Power BI, leveraged via apps built with PowerApps (e.g. a user action in a PowerApp might kick off an approval process) and integrated with events from any of the hundreds of systems the Power Platform natively supports. The workflows run completely in the cloud and are fully managed and secured by Microsoft. Power BI, PowerApps and Flow each represents best-of-breed solutions in their individual categories, but their combination as the Power Platform is a game-changer without equal for our customers. Power BI unlocks insights and intelligence, PowerApps converts that intelligence into action through transformative applications built in record time, and Flow makes business process orchestration an easy point and click exercise … with further feedback to Power BI creating a powerful system of continuous improvement. Putting this power to “analyze, act and automate” in the hands of individuals who know their business best, with built-in connectors to all the systems and sources of data in an organization, creates previously unimaginable transformation opportunities for our customers. SNCF operates France’s national rail service and is a global leader in passenger and freight transport services. With 270,000 employees spread across 120 countries, it aims to become the benchmark for mobility and logistics solutions in France and worldwide. SNCF is a great example of a customer that has gone “all in” with the Power Platform. As with many customers, initial adoption was grassroots in nature – starting in some places with Power BI and others with PowerApps. They quickly realized the potential the platform represented for their business and has built a company-wide center of excellence to educate, train and support the thousands of employees now using the platform to help shape the future of SNCF. Here is a short video that highlights the great work they’re doing at SNCF. It has been an exciting journey for all of us on the team. In so many ways we are just getting started. As we look forward to the year ahead, we are planning to deliver some really special product developments. These will come together across all of our offerings – from Dynamics 365 to the Power Platform – as part of our April 2019 release. You can get ready for that now by checking out the Dynamics 365 and Power Platform, April 2019 release notes. I would also welcome you to join us for our Virtual Launch Event in April, where we may have a few added surprises. And lastly, to our community of makers and creators – thank you for being on this journey with us. Your dedication, energy, and ingenuity inspire me. Your passion literally has me running up the stairs every day when I come to work. Thank you. Hope to see you all soon!